Find the best 3 day tours and trips starting from Munich. Choose from 33 tours - we've found the most popular time to visit is in September with the most number of tour departures. "The tour was awesome! Lots of information and never had to worry. 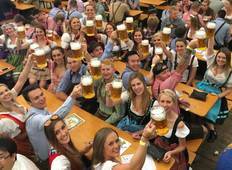 Really worth every..."
"Micaela stood out for me on this tour because she went above and beyond to make everyone..."
"I was lucky enough to spend time with Stoke during 2016 Oktoberfest. Over my 4 months..."
"I travelled with Stoke in 2017 it was an insaaaaaaaaaane time. The unlimited beer..."
"Excellent tour guide who was highly entertaining with great energy and was a lot..."
"We really enjoyed the festivities, thank you." "Our tour guide has been fantastic, full of energy & sense of adventure. 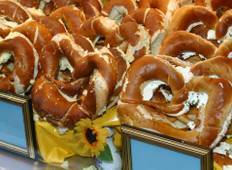 We had enough..."
"Went to Oktoberfest on the second weekend of 2017 (this only gave me the option of..."
"I did Stoke Travel for Oktoberfest and it was absolutely amazing! The daily breakfasts..."
"Absolutely amazing time and the group of people that were there were a tonne of fun...."